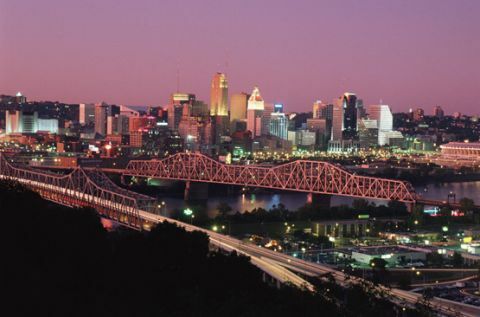 Nearly 350,000 people call Cincinnati, along the banks of the Ohio River, home. The city places an emphasis on tourism, with plenty of attractions for fun seekers, including King's Island and Coney Island amusement parks. Other family-friendly activities include the Cincinnati Zoo and Botanical Garden and the Newport Aquarium. EnterTrainment Junction is a unique, railroad-themed family attraction featuring interactive model train layouts and play areas. The MLB Cincinnati Reds play at the Great American Ball Park downtown, and the NFL Cincinnati Bengals also call this town home. Art and history buffs can take in one of several art museums or the National Underground Railroad Museum, documenting the fight against slavery. The city is also home to the University of Cincinnati, one of the largest colleges in the state. • Ohio - Find travel information, maps, tourist resources, and more photos of Ohio. • City of Cincinnati - Visit the official government website for Cincinnati, Ohio. • Greater Cincinnati Convention and Visitors Bureau - Find Cincinnati visitor, meeting planner, and media information. • Cincinnati Guide - Business directory and maps of Cincinnati, Ohio.